Screenshot of Andrew Scheer with Rachael Harder and Conservative MPs today in the lobby of the House of Commons. Source: Harder’s Facebook page. 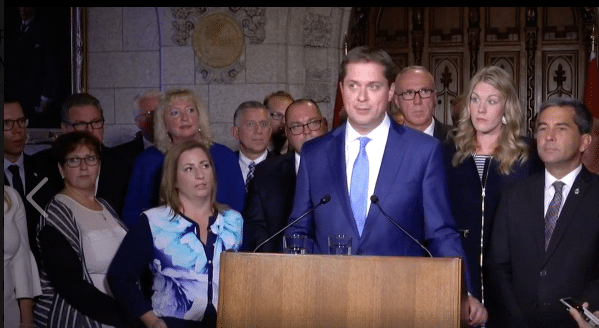 TheGunBlog.ca — Andrew Scheer, the leader of Canada’s Conservative Party and of the official opposition, leveled one of his strongest critiques of government firearm policy and made an election promise today. He pledged to repeal Bill C-71 if elected prime minister and rejected any handgun ban. The Liberal government of Prime Minister Justin Trudeau will present Bill C-71 for its third and final reading in the House of Commons tomorrow, Rachael Harder, a Conservative MP from Alberta, told reporters today in the lobby of the House. If it passes the reading, the proposed law will head to the Senate for review. Scheer’s comments suggest he expects it to become law by Christmas. The bill proposes to seize more firearms from owners licensed under the authority of the federal police and to make it harder for them to buy, sell, own and transport guns. It will also potentially give the government of Quebec the personal information of every gun owner in Canada with the list of firearms they own. More Canadian men and women have a firearm licence than play hockey. Millions of people of all ages across the country use guns for protection, hunting, recreation and competition. Scheer’s opposition to punishing lawful gun owners adds to that of at least two provincial premiers, the country’s most senior police leaders and private individuals across the country. The government’s firearm policy is also dividing Liberal members of parliament. Harder officially submitted a petition against Bill C-71 earlier in the day. More than 86,000 people supported the online protest she sponsored, the second-most-signed e-petition on record at the House of Commons. I just tabled Ryan Slingerland's petition, with more than 86,000 signatures from Canadians who oppose Bill C-71, in the House of Commons. As the sponsor of this petition, it has been my pleasure to provide an official way for Canadians to register their opposition to this reckless legislation. The Conservatives haven’t always stood with shooters. Prime Minister Brian Mulroney passed laws in the early 1990s to limit the capacity of ammunition magazines. Gun owners and gear sellers still risk prison if they don’t sabotage equipment to comply, typically by drilling holes and installing cheap rivets as stoppers. 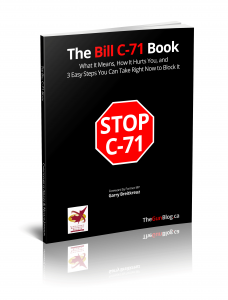 Bill C-71 also solidified the Liberal Party’s reputation for hostility against hunters and shooters. It’s the first legislation aimed directly at punishing them since the Liberals passed the Firearms Act in 1995. A major public-relations firm said in March the Liberals could win votes and strengthen their control of parliament by exploiting fear and ignorance among centre-left voters and imposing new restrictions on gun owners. Trudeau last month instructed a minister to examine a “full ban” on handguns and other firearms owned by hunters, plinkers and sport shooters in addition to the confiscations in Bill C-71. After Harder and Scheer spoke today, a reporter asked the Conservative leader if he supports a handgun ban.